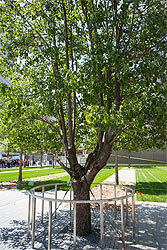 September 9, 2013 – New York, New York - On September 11, 2001, one tree, a Bradford Pear, survived the World Trade Center attacks. Barely alive, it endured following years of off-site intensive care and rehabilitation by The New York Parks Department. Home again at the World Trade Center and cared for by Bartlett Tree Experts, The Survivor Tree now thrives, and is a national symbol of hope and resiliency. During the tree’s rehabilitation, tree scientists at Bartlett collected seeds and propagated 450 descendants of the original tree. Today, the saplings average three to four feet in height, and now reside on the grounds of John Bowne Agricultural High School in Flushing, Queens, New York. As part of the newly unveiled Survivor Tree Seedling Program, each year henceforth, saplings will be conveyed in September to communities affected by tragedy. As with the Survivor Tree, the saplings will provide an inspirational landmark for these communities, in the spirit of hope and resiliency. The City of Boston: in honor of the three killed and many injured in the Boston Marathon bombings on April 15, 2013. Far Rockaways, NY: for the devastation sustained from Superstorm Sandy in 2012. Prescott, Arizona: in honor of the fallen members of the Granite Mountain Hotshots, an elite firefighting squad that lost 19 men on June 30, 2013.